Download Perfectly Cooked Egg now for FREE! 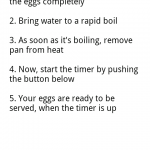 Have you ever had the trouble remembering how long an egg needs to be boiled to be just the way you want it? Hard-boiled, medium-boiled or soft-boiled. Medium-sized egg, large eggs, extra-large eggs. Boiling eggs can be frustrating. But there is no need to be frustrated. Because: We have the right app for you! 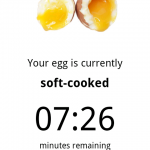 Boil your perfect morning egg with the Perfectly Cooked Egg app for android. 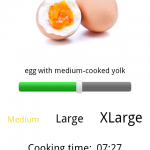 Hard-boiled, medium-boiled or soft-boiled egg, with this app it’s just that easy.